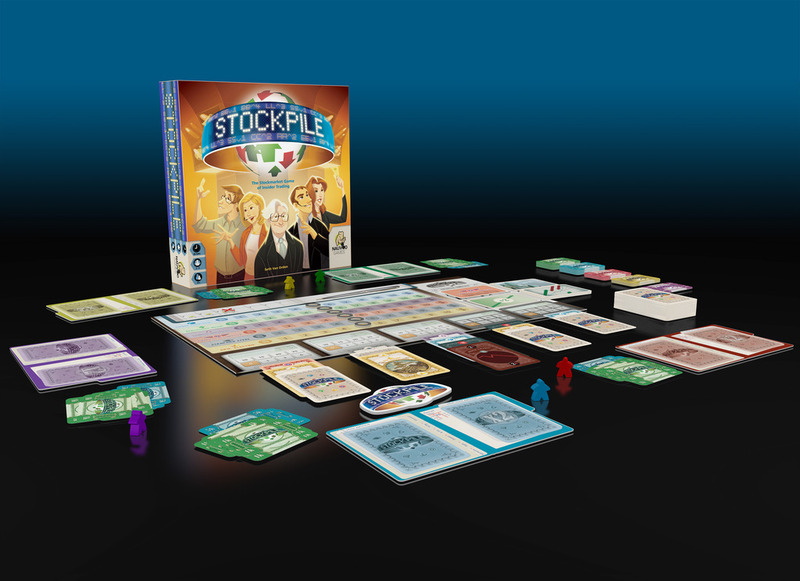 Stockpile is a really simple game once you’ve gone over a round. The round is divided into five phases, but once you’ve gone through them once they will flow easily. The game has six different stocks that you will watch with excitement as they go up and down during the game. They might crash (reach zero value) and they might split (reach the top value and then each stock is now considered two stocks). Selling and buying at the right time is really all there is to the game but the process and psychology is rewarding and deep. Each round you get some public information about one stock and a personal tip about another stock (insider trading huzzah!). This comes in the form of a set of stock movement cards. Thus, each player knows something about just two out of six stocks and how they will go up and down. But as there are only six stocks and six different possible pairings with these stocks, you might be able to deduct some information from the other players’ actions. Soon after this you will go through an easy process to create piles of stocks that is available to bid on in an auction. It is imperative to bid less than the current value of the stocks in the pile in order to make money on your deals. But thankfully you may have exclusive information that makes one pile look really interesting to only you. Therefore, you might want to bid higher than the rest of the players on that pile, however, you don’t want to pay too much and you don’t want the other players to know that you REALLY want that pile. So it’s you have to balance your bluffing and double bluffing. With your newly won stocks in hand, it is now time to sell any stocks you want to get rid of. But once again the information you have is limited as you do this before the previously mentioned stock movement cards are executed. In this way you might know something that lets you take an informed decision on what to sell. But in most cases all you have to go on is what the other players do. This introduces another level of psychology and bluffing: If one player sells out of all his railway stocks, you might want to sell yours as well – or is she selling only parts of her inventory to lead you on? Or to buff up her cash reserves? In this way the game emulates the psychology of the actual stock market. It feels incredible to make a great buy and to sell at the perfect moment, but in some games you will just feel like everything is against you and your stocks crash left and right. Do you want to diversify or put your money in one stock and hope it goes through the roof? In stockpile the best player will win most of the time, but even the best can get hit by bad luck. Just like on the real stock markets. And it is always a series of nail biting decisions. 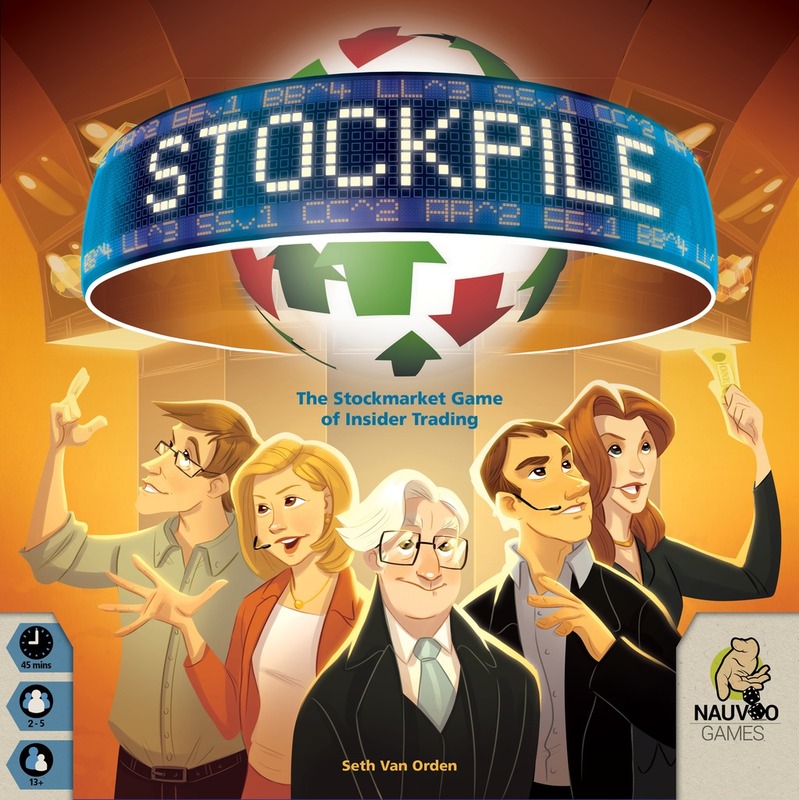 Stockpile is a game I didn’t think I would like. The stock theme doesn’t really appeal to me, but wow. This game is so good at creating a story of ups and downs in a 30-45 min package. The gameplay is simple but deep and I think almost anyone can play it and understand it. The game is incredibly varied and comes with variable player powers and the stock board is two sided with one simple and one advanced side that brings even more re-playability. I have played this game more than any other game this year and it is a front runner for game of the year for me. I have played about 20 games of it and still love it. This game is a very easy game to learn (almost got a 1 complexity rating). The rule book doesn’t make it as easy as it could be but if you go through the different steps one at a time while sitting at the table with the other players everyone will know everything soon enough. My advice is to play through all the steps of a round once, reset the game and play for real now as everyone will understand the mechanisms in the game.